The VQ37VHR engine was developed on the base of the VQ35HR and appeared in 2007. 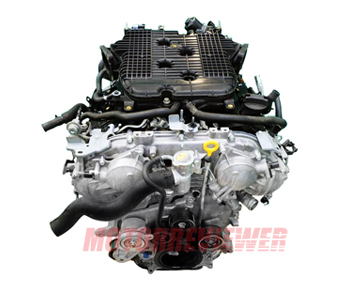 This engine is used by a majority of modern Infiniti models and sport Nissan vehicles. This 3.7-liter engine is the most advanced engine in VQ-series. The cylinder block of this engine is taller than VQ35HR and engine has a bigger stroke while the cylinder bore is the same. There are new light pistons and connecting rods. These changes allowed getting in result 3.7-liter displacement instead of 3.5 liters. The engine got new redeveloped aluminum cylinder heads (12 valves, two camshafts). Engineers redesigned inside channels and installed the new intake and exhaust valves. They firstly used Nissan Variable Valve Event and Lift system on this engine. And also both camshafts were already equipped with variable valve timing CVTC. On top of the engine, you can see the reshaped plastic intake manifold. The engine uses timing chain as before. Although increased torque by only 1.5 ft-lb (2 Nm), compared with VQ35HR, the maximum value is reached at 5200 rpm against 4800 rpm as VQ35HR. The torque curve itself was also improved. The engine has good reliability, but like the VQ-series engine it has some common problems, you can read about them here.